I recently bought this saw from Home Depot after it went on sale to include the DeWalt stand (DW723). After assembling it, i noticed a few things I wanted to modify. 1. This, I thought was just a cheap way to make the power cord come off the saw. On the Ridgid 12" CMS it comes out the slide tube. The reason the Dewalt didn't do it this way is there is very little room as they wanted the saw to make very tight (60*) miter cuts and have very high clearance. Since I don't need that I don't really care, just as long as I can make a 45+-2* I'll be fine. So I cut thick pipe strap and bent it 90*. 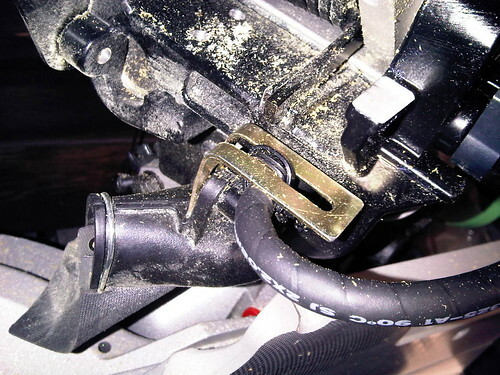 and use the saw dust port holder screw. Then used a "P" cable clip and a M4-20 bolt washer and a nut. to protect the cable I'm using spiral cable wrap. 2. The best thing I can think of is a big plastic tub with a hole in the bottom for a vacuum hook up.